... and presumably very heavy lump of metal, while not impervious to the wrath of nature, probably has a better chance than most. The book can be found on Google Books and the article is on page 152. An excerpt from the book is on the Google Books tab below. This is not correct. 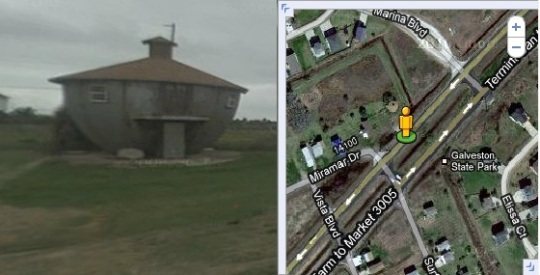 A check on Google Maps using Satellite view does reveal a circular structure at this location but "Street View" clearly shows this is not the "Kettle House" as shown below. will get you close; from there the "Kettle House" is a little to the north east. Please note: For some reason Google Books has been very slow to respond of late. If the iframe has not populated refresh the page; it usually seems to work the second time around. http://goo.gl/maps/kAfAS Map from incorrect address to actual address, and a street view pic. Funny, I live in a house that across the street from this and I saw it literally every single day when I was still living in Galveston. Definitely the sturdiest little building I've ever seen, but I've never once seen the inside of it. I pretty much settled that it must have just been used for water storage and left it at that. Seeing this is making me really interested in taking a look inside next time I go back to Galveston. It was a water tower from the 1800's. has anyone ever seen the inside? any pics online? I too would be interested to see the inside - to date I have never been able to find any photos of the inside online. If anyone has any I would love to see them. Sad, the kettle does not look maintained, lived in or used at all. It looks like, the main use area is upstairs, with storage down below that can tolerate flooding from bad storms. Round buildings always look smaller from the outside, than they feel inside. Round shapes tolerate far worse storms/wind than flat walls can. 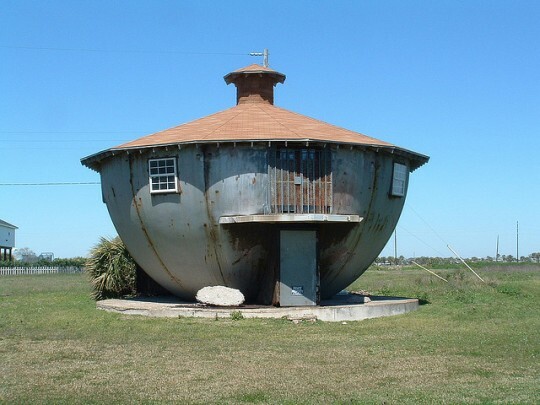 This one looks like it might even be able to float, unless it's embedded in all that cement foundation. Clayton E. Stokley, 82 of Pasadena, passed away Wednesday, June 29, 2005. He served in the U.S. Army during WWII, a member of the American Post 521 and received the Silver Star, Gold Star and the Purple Heart medals. He is preceded in death by wife, Patsy Lou Stokley and son, Joseph Will Stokley. He is survived by daughters, Mary Nell Etheridge-Rachels and husband Michael, Linda Joyce Stokley; sons, David Ross Stokley and wife Lisa, Edgar Barry Stokley and wife Patricia, Clayton E. Stokley Jr.; brothers, Horace Stokley, James H. Stokley and wife Margie; grandchildren, Nicole R. Stokley, Christina Ann Stokley, Elizabeth Barri Stokley, Joseph Will Stokley Jr. and Derrick Devin Etheridge; great grandchildren, Ezra Isabel Juarez and Mia Alexandra Juarez. Visitation will be from 6-9 P.M. on Friday, July 1, 2005 at Grand View Funeral Home. Funeral services will be held at 3:00 P.M. on Saturday, July 2, 2005 at Grand View Funeral Home. Interment to follow at Grand View Memorial Park. Has anyone researched and tried to get in touch with grandchildren? I would LOVE to live in this house and do the maintenance required! I am disabled and on ssi but can do some of the work and friends who can help.If the owners see this and interested, please contact me at marcusdixon@yahoo.com! You wont regret the changes I can make! I live in Kemah alone and it would be perfect size for just me! Please contact me! and yes, I can pay rent rent also! Always loved the structure!